Fruit maturation and ripening are genetically regulated processes that involve a complex interplay of plant hormones, growth regulators and multiple biological and environmental factors. Tomato (Solanum lycopersicum) has been used as a model of biological and genetic studies on the regulation of specific ripening pathways, including ethylene, carotenoid and cell wall metabolism. This model has also been used to investigate the functions of upstream signalling and transcriptional regulators. Thus far, many ripening-associated transcription factors that influence fruit development and ripening have been reported. NAC transcription factors are plant specific and play important roles in many stages of plant growth and development, such as lateral root formation, secondary cell wall synthesis, and embryo, floral organ, vegetative organ and fruit development. Tissue-specific analysis by quantitative real-time PCR showed that SlNAC1 was highly accumulated in immature green fruits; the expression of SlNAC1 increased with fruit ripening till to the highest level at 7 d after the breaker stage. The overexpression of SlNAC1 resulted in reduced carotenoids by altering carotenoid pathway flux and decreasing ethylene synthesis mediated mainly by the reduced expression of ethylene biosynthetic genes of system-2, thus led to yellow or orange mature fruits. The results of yeast one-hybrid experiment demonstrated that SlNAC1 can interact with the regulatory regions of genes related lycopene and ethylene synthesis. These results also indicated that SlNAC1 inhibited fruit ripening by affecting ethylene synthesis and carotenoid accumulation in SlNAC1 overexpression lines. In addition, the overexpression of SlNAC1 reduced the firmness of the fruits and the thickness of the pericarp and produced more abscisic acid, resulting in the early softening of fruits. Hence, in SlNAC1 overexpression lines, both ethylene-dependent and abscisic acid-dependent pathways are regulated by SlNAC1 in fruit ripening regulatory network. 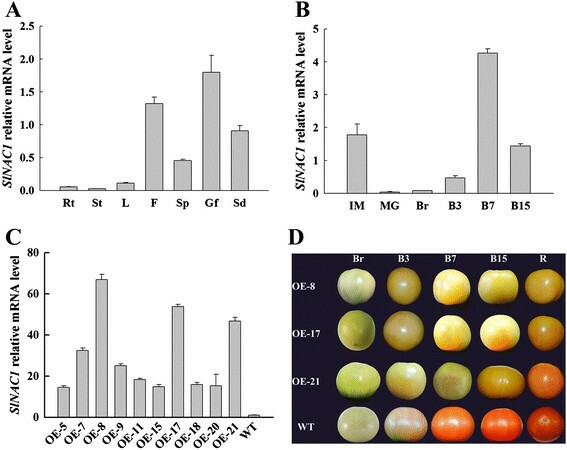 SlNAC1 had a broad influence on tomato fruit ripening and regulated SlNAC1 overexpression tomato fruit ripening through both ethylene-dependent and abscisic acid-dependent pathways. Thus, this study provided new insights into the current model of tomato fruit ripening regulatory network. Fruit ripening is a genetically regulated process that involves numerous metabolic changes in colour, flavour, texture and aroma; these changes are controlled by endogenous hormonal and genetic regulators and external signals (temperature, light and hydration) . This process has been stimulated using tomato as an excellent model of fleshy fruit development and ripening; tomato has been utilised as an excellent model because of several advantages, including well-characterised ripening mutants, small genome size, high-density genetic maps, short life cycle, efficient transient and stable transformation and complete genome sequence -. On the basis of the induction of respiration and ethylene at the onset of ripening, scholars categorised tomato as a climacteric fruit. Ripening in climacteric fruits can also be initiated by exposure to exogenous ethylene. Grierson  reviewed that ethylene induces ripening in climacteric fruits by using tomato as a model. Antisense genes are used to suppress the expression of ACO1 and ACS2, which respectively encode 1-aminocyclopropane-1-carboxylic acid (ACC) oxidase (ACO) and ACC synthase (ACS); ACO and ACS are the major enzymes involved in ethylene biosynthesis. ACS is encoded in tomato by a multi-gene family with at least eight members and three other putative genes in the genome sequence . ACO is encoded in tomato by a multi-gene family of at least four characterised ACOs and three other putative genes in the genome sequence . Previous studies also characterised the effect of ethylene on gene expression during climacteric ripening -. Ethylene induces the expressions of ACS2 and ACS4, which are important in tomato fruit ripening ,. The upregulation of ACS1A and ACS4 at ripening initiation produces ethylene, which induces ACS2 and ACS4 to mediate autocatalytic ethylene synthesis, a process typically observed in climacteric ripening. ACS2 and ACO1 control ethylene production in tomato fruits . The plant hormone abscisic acid (ABA) not only regulates seed dormancy, plant growth and development, and responses to environmental stresses - but also displays a pattern of change similar to ethylene at late stages of fruit development ,. Because the ABA content in ABA-deficient mutants was 75% lower than the normal level, both the plant and fruit did not show the normal growth observed in the wild type; the total fruit weight and average fruit weight in ABA-deficient mutant fruits were reduced compared with wild-type fruit, and the plant weight was 50% lower in the ABA-deficient plant than in the wild type, indicating that ABA was not only required for plant growth, but was also indispensable for fruit development and ripening . In addition, application of exogenous ABA can increase the pigmentation and promoted ripening of sweet cherry fruits . Exogenous ABA accelerates fruit ripening, and fluridone or NDGA treatment delays fruit ripening by ABA inhibition . Sun et al. reported that suppressed SlNCED1 by RNA interference resulted in reduced ABA accumulation in transgenic fruit, which led to down-regulation of genes encoding major cell wall catabolic enzymes. These reports demonstrate that ABA plays important roles in fruit ripening. Genes involved in rare mutations that completely inhibit normal ripening have been identified; such advancement is considered as a major breakthrough in determining the transcriptional control of tomato ripening . These mutations include rin (ripening inhibitor), nor (non-ripening) and Cnr (colourless non-ripening). Gene cloning efforts have shown that rin results from the deletion of the last exon of a tomato MADS-box transcription factor gene (LeMADS-RIN); rin is necessary to promote tomato fruit ripening . The mutation of rin affects all of the involved ripening pathways; this finding supports the function of this gene as a master regulator of ripening . Chromatin immunoprecipitation coupled with DNA microarray analysis and transcriptome analysis have been performed to identify 241 direct RIN target genes that contain a RIN binding site and exhibit RIN-dependent positive or negative regulation during fruit ripening . The targets of RIN include known genes, such as ACS2, ACS4, NR (Never ripe), E8, PG (polygalacturonase), TBG4 (galactanase 4), EXP1 (expansin 1), PSY1 (phytoene synthase 1), NOR, CNR, TDR4, HB-1 and RIN itself -. Another study has revealed new targets, including bHLH (basic helix-loop-helix), NAC (NAM, ATAF1/ATAF2, CUC2), basic leucine zipper (bZIP) transcription factor (TF), zinc finger protein and APETALA2a . In addition to RIN, Cnr and NOR, other TF genes, including AGAMOUS-LIKE1, HD-ZIP HOMEOBOX PROTEIN-1, ETHYLENE RESPONSE FACTOR6, FRUITFULL1, FRUITFUL2, SlMADS1 and APRR2-Like, function in tomato fruit ripening -. NOR, a member of the NAC domain family, functions upstream of ethylene in the tomato fruit ripening cascade; NOR mutation leads to a non-ripening phenotype similar to that observed in rin . SlNAC4 positively regulates fruit ripening by affecting ethylene synthesis and carotenoid accumulation . However, the mechanisms of action of the other NAC TFs involved in fruit ripening remain unknown. SlNAC1 interacts with tomato leaf curl virus replication accessory protein and enhances viral replication . This gene is also involved in abiotic stress , and pathogen infection response . In the present study, the transcripts of SlNAC1 highly accumulated in fruit tissues and increased with fruit ripening. The overexpression of SlNAC1 reduced the accumulation of total carotenoid and lycopene, ethylene production, fruit firmness and thickness of pericarp, but increased abscisic acid (ABA) contents. In transgenic fruits, genes involved in lycopene and ethylene biosynthesis were downregulated, whereas genes related to lutein, β-carotene and ABA synthesis as well as genes related to cell wall metabolism were upregulated. In addition, yeast one-hybrid assay results indicated that SlNAC1 interacted with SlPSY1, SlACS2 and SlACO1. These results suggested that SlNAC1 regulated tomato fruit ripening via ethylene-dependent and ABA-dependent ripening pathways in SlNAC1 overexpression lines. The expression profile of SlNAC1 in the roots, stems, leaves, flowers, sepals, green fruit and seeds was explored by quantitative real-time PCR (qRT-PCR). SlNAC1 transcript showed higher expression levels in flowers, green fruits and seeds and the most transcripts of SlNAC1 accumulated in green fruit, whereas lower expression levels were in root, stems and leaves (Figure 1A). These results suggested that SlNAC1 may be related to fruit development. In line with this, transcripts of SlNAC1 accumulated more at the immature green stage, then decreased at the mature green stage, and gradually increased until 7 d after breaker (Figure 1B). These results indicated that SlNAC1 is likely to function in tomato fruit tissue. qRT-PCR analysis of SlNAC1 expression and phenotypes of OE and WT fruits. (A) Transcripts of SlNAC1 accumulated in different tissues. Rt, root; St, stem; L, leaf; F, flower; Sp, sepal; Gf, green fruit; Sd, seed. The pericarp tissues of the green fruits were used. (B) The relative mRNA level of SlNAC1 as fruit ripened. The pericarp tissues of fruits at different stages were used to perform the experiment. (C) qRT-PCR expression analysis of SlNAC1 in OE lines and WT. Total RNA from the pericarp tissues of fruits at B7 stage was subjected to quantitative RT-PCR analysis. (D) Phenotypes of OE and WT fruits along with the developmental stages. IM, immature green; MG, mature green; Br, breaker; B3, 3 d after breaker; B7, 7 d after breaker; B15, 15 d after breaker; R, ripe. Data are the means ± SD of three independent experiments. The WT expression data are normalised to 1. To test whether SlNAC1 is involved in tomato fruit ripening, we created the transgenic tomato lines by overexpressing this gene with its full-length cDNA under CaMV 35S promter. Ten independent overexpressed (OE) transgenic lines were obtained. Among them, OE-8, OE-17 and OE-21were detected with the higher expression levels of SlNAC1 (Figure 1C), and were selected to perform the further experiments. In Figure 1D, the ripe fruits of three OE lines exhibited yellow or orange appearance compared with those of the wild-type (WT) line. 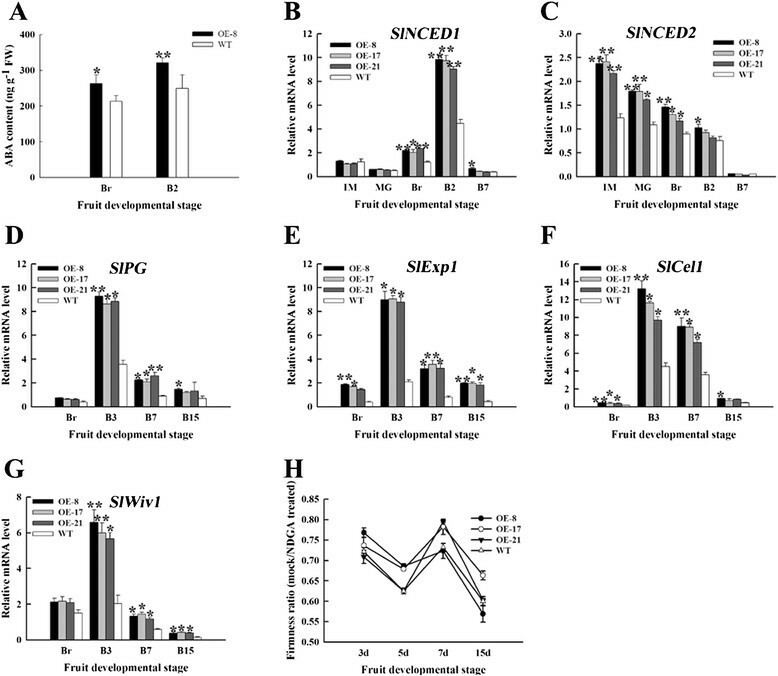 These data indicate that overexpression of SlNAC1 inhibits normal fruit ripening. Approximately 101 NAC TFs in tomato are found in The Plant Transcription Factor Database (http://planttfdb.cbi.pku.edu.cn/) . To confirm only SlNAC1 was overexpressed in transgenic plants, we tested the expression of four other NACs that contain sequences with higher homology to SlNAC1, as indicated in the phylogenetic tree in the database. In Figure 2, the expression levels of these four other NACs were not significantly different at different stages between OE and WT fruits. These data indicated that overexression of SlNAC1 does not affect the expression of closely related NAC genes. Expression of four other NAC transcription factors in OE and WT fruits. The pericarp tissues of fruits in different stages were used to perform the experiment. MG, mature green; Br, breaker; B3, 3 d after breaker; B7, 7 d after breaker. Data are the means ± SD of three independent experiments. Lycopene is responsible for the red pigmentation of ripe tomato fruit; lycopene accounts for 70% to 90% of carotenoids in most varieties, whereas β-carotene accounts for the bulk of the remaining proportion (5% to 40%) ,. In the present study, the total carotenoid contents of OE fruits were significantly reduced to 19.1%, 21.6% and 27.3% of WT fruits in OE-8, OE-17 and OE-21, respectively (Figure 3A). The lutein contents of OE fruits accumulated by 1.1 to 1.9 times higher than those of WT fruits and β-carotene contents of OE fruits also accumulated about 1.2 times higher than those of WT fruits. However, the lycopene contents in OE fruits were reduced by 83.5% to 99.6% compared with that of the WT fruits (Figure 3B). These data are consistent with fruit pigmentation. Carotenoids contents and expression of carotenoid biosynthesis genes in OE and WT fruits. (A) Total carotenoid content in OE and WT fruits at B20. (B) Contents of lutein, β-carotene and lycopene in OE and WT fruits at B20. (C) to (F) Expression analysis of genes related to carotenoid synthesis. The relative mRNA levels of SlPSY1 (C), SlLCYb (D), SlLCYe (E) and SlCYCB (F) at indicated developmental stages were shown. MG, mature green; Br, breaker; B3, 3 d after breaker; B7, 7 d after breaker. Data are the means ± SD of three independent experiments. The asterisks indicate statistically significant differences between OE and WT fruits (*P < 0.05, **P < 0.01). Considering the distinct changes in the carotenoid composition of OE fruits, we analysed the genes’ transcript levels involved in carotenoid biosynthesis (Additional file 1: Figure S1) by qRT-PCR. PSY1 is a rate-limiting enzyme of carotenoid biosynthesis in tomato and is partly responsible for regulating flux via the pathway during ripening ,. qRT-PCR results suggested that the expression level of SlPSY1 was downregulated in the OE fruits accounting for reduced lycopene and total carotenoids in ripening fruits (Figure 3C). However, SlLCYb (lycopene β-cyclase), SlLCYe (lycopene ε-cyclase) and SlCYCB (chromoplast-specific lycopene β-cyclase) were upregulated in OE fruits, demonstrating the metabolism of lycopene to β-carotene and lutein (Figures 3D to 3F). These results suggest that the altered pigmentation of OE fruits is consistent with the changes in the expression of genes related to lycopene synthesis and decomposition observed. Ethylene regulates carotenoid and lycopene accumulation during ripening by upregulating SlPSY1 . Fruits released ethylene after Br was measured to determine whether or not the phenotype observed is caused by the change in ethylene contents. Ethylene production of OE and WT fruits had the similar pattern and the climacteric peak of both OE and WT fruits emerged at B3, but the climacteric peaks of the OE fruits were clearly lower than those of the WT fruits; these peaks were reduced by 54% to 79% (Figure 4A). We then detected the relative mRNA levels of the genes related to ethylene biosynthesis. 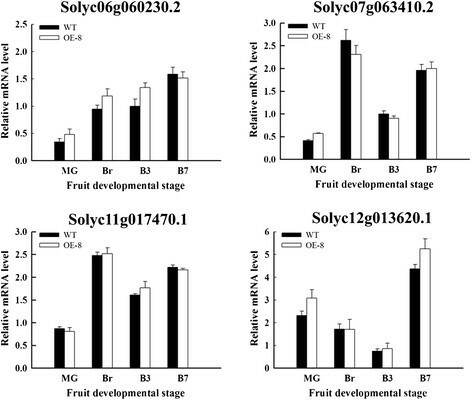 The expressions of SlACS2, SlACS4 and SlACO1 in the OE fruits exhibited varying degrees of repression compared with those of WT fruits; this result is consistent with the production of ethylene (Figures 4B to 4D). After the fruits of the OE-8 line at the breaker stage were treated with ethephon for 7 d, the phenotypes of the treated fruit could be partly resumed (Figure 4E). These results illustrated that the pigmentation of SlNAC1 overexpresion tomato fruits is partly dependent on ethylene. Ethylene emission and expression of ethylene synthesis genes in OE and WT fruits. (A) Ethylene production of OE and WT fruits was detected at the indicated stage. (B) to (D) qRT-PCR analysis of genes related to ethylene synthesis. The expression of SlACS2 (B), SlACS4 (C) and SlACO1 (D) were detected between OE and WT fruits. (E) Changes in the phenotypes of OE-8 fruits after these fruits were treated with ethephon. MG, mature green; Br, breaker; B3, 3 d after breaker; B7, 7 d after breaker. Data are the means ± SD of three independent experiments. The asterisks indicate statistically significant differences between OE and WT fruits (*P < 0.05, **P < 0.01). Transcription factors often regulate gene expression by binding to their promoters to promote or inhibit the corresponding transcription. So we wanted to know whether SlNAC1 could directly bind to the promoters of SlPSY1, SlACS2 and SlACO1. The highly conserved positively charged subdomains C and D (Figure 5A) of NAC TFs can bind to DNA . CACG  and C/TACG  sequences are the core DNA motif recognised by Arabidopsis ANAC. Selth et al. reported that the N-terminal 169 amino acid residues of SlNAC1 contain the five conserved subdomains that comprise the NAC domain and SlNAC1 acts as a transcription activator in yeast. On the basis of these previous studies, we selected the fragment containing subdomains C and D of SlNAC1 and the promoter regions containing the C/TACG sequence to perform yeast one-hybrid assay. 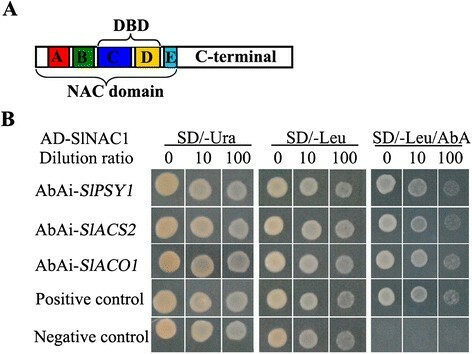 As shown in Figure 5B, after cotransformation, the yeast strains containing the DNA binding domain of SlNAC1 and the promoters of SlPSY1, SlACS2, and SlACO1 could grow on SD/-Ura, SD/-Leu and SD/-Leu/AbA auxotrophic medium, suggesting SlNAC1 might interacted with the regulatory regions of SlPSY1, SlACS2 and SlACO1 in vivo. This result indicated that SlNAC1 regulates the expression of these genes to finely regulate lycopene and ethylene synthesis. Yeast one-hybrid assay between SlNAC1 and SlPSY1 , SlACS2 and SlACO1 promoters. (A) Structure of SlNAC1. The five subdomains (A to E) comprising the NAC domain and the C-terminal are shown. We selected the region from the 65th amino acid to the 149th amino acid containing the DNA binding domain (DBD) to construct the pGADT7 AD-SlNAC1 recombinant plastid. (B) Yeast one-hybrid assay results. SD/-Ura, SD medium without Ura; SD/-Leu, SD medium without Leu; SD/-Leu/AbA, SD medium without Leu but containing Aureobasidin A. The p53-AbAi control vector and the pAbAi vector were used as positive and negative controls, respectively. Fruit softening is associated with ripening and ethylene can accelerate fruit softening. As such, we measured fruit firmness (softening rate) to determine whether or not OE fruits softened later than WT fruits. Our results showed that the firmness of OE fruits was lower than that of the WT fruits at the same stage, meaning the earlier softening of OE fruits, which was inconsistent with ethylene emission (Figure 6A). In addition, fruit pericarp thickness was notably reduced in mature OE fruits (Figure 6B) with over 50% reduction at B15 stage (Figure 6C). Reduced pericarp thickness is correlated with reduced firmness in mature OE fruit, suggesting the contribution of pericarp thickness to fruit softening. Moreover, the seed size of OE fruits was larger than that of WT fruits and OE fruits produced more seeds than WT fruits (data not shown). These results indicated that the overexpression of SlNAC1 resulted in broad changes of fruit development and ripening. Fruit firmness and pericarp thickness of OE and WT fruits. (A) Fruit firmness of OE and WT fruits was evaluated at the indicated stage. Br, breaker; B3, 3 d after breaker; B5, 5 d after breaker; B7, 7 d after breaker; B15, 15 d after breaker. (B) Cross-sections of OE-8 and WT fruits at B15. OE fruits showed thinner pericarp (white line indicated) compared with WT fruits. (C) The statistics of pericarp thickness between OE and WT fruits in the breaker stage. Data are the means ± SD of at least 10 individual fruits. The asterisks indicate statistically significant differences between OE and WT fruits (*P < 0.05, **P < 0.01). The inconformity between ethylene and fruit softening of OE fruits implied that other factors except ethylene might play roles in fruit softening in tomato. Sun et al. reported that ABA affected cell wall catabolism during tomato fruit ripening by regulating the expression of major catabolic genes and the ABA peak often appears earlier than ethylene peak. To determine whether the different softening rate between OE and WT fruits was resulted from ABA changes, we measured the endogenous ABA contents of OE-8 and WT fruits at Br and B2 stages. Figure 7A showed that ABA contents of OE-8 fruits were higher than those of WT fruits at the same stages. Similarly, the expression of SlNCED1 (9-cis-epoxycarotenoid dioxygenase) and SlNCED2 in OE fruits was upregulated compared with those in WT fruits, especially at the early stages of ripening (Figures 7B and 7C). Also, the expression levels of genes related to cell wall metabolism in OE fruits, such as SlPG, SlExp1, SlCel1 (endo-1,4-β cellulose) and SlWiv1 (cell wall invertase), were enhanced compared with those in WT fruits (Figures 7D to 7G). For further validation, OE and WT fruits were treated with NGDA (nordihydroguaiaretic acid, an inhibitor of ABA synthesis) at breaker stage. After NDGA treatment, the firmness of fruits was increased compared with untreated fruits (Figure 7H). These results indicated that overexpression of SlNAC1 led to ABA accumulation, which at least contributed to fruit softening. ABA contents, expression of genes related to ABA synthesis and cell-wall metabolism and NDGA treatment. (A) ABA contents between OE-8 and WT fruits. (B) Expression of SlNCED1. (C) Expression of SlNCED2. (D) to (G) qRT-PCR analysis of genes related to cell-wall metabolism. The expression of SlPG (D), SlExp1 (E), SlCel1 (F) and SlWiv1 (G) were detected between OE and WT fruits. (H) The ratio of firmness of mock fruits to NDGA treated fruits. IM, immature green; McG, mature green; Br, breaker; B2, 2 d after breaker; B3, 3 d after breaker; B7, 7 d after breaker; B15, 15 d after breaker. Data are the means ± SD of three independent experiments. The asterisks indicate statistically significant differences between OE and WT fruits (*P < 0.05, **P < 0.01). The development of red pigmentation in ripening tomato fruit is caused by the accumulation of lycopene (red) and β-carotene (orange), which represent the majority of the total fruit carotenoids . NOR is a member of NAC transcription factor and its mutant nor is phenotypically similar to rin in that nor fruit fail to produce climacteric ethylene or ripen yet show responsiveness to ethylene at the molecular level while similarly failing to ripen in response to ethylene . NOR RNAi tomato showed ripening defects (slight orange color) from the B + 4 stage in pericarp compared with WT ripening fruits, suggesting alteration of carotenoid composition. Additionally, the placenta of SlNAC4 RNAi fruits failed to acquire red pigmentation and softening appearance from the B + 7 stage . Our results showed that fruits overexpressing SlNAC1 displayed yellow/orange colour (Figure 1D). The phenotype of SlNAC1 overexpression fruits was different from that of nor and SlNAC4 RNAi fruits. The yellow/orange fruits were caused by the decreased accumulation of lycopene and elevated lutein and β-carotene (Figure 3B), partially explaining why OE fruits failed to fully turn red. qRT-PCR analysis showed that PSY1, a major regulator of flux towards carotenoid biosynthetic pathway, was significantly reduced because of the overexpression of SlNAC1 (Figure 3C). In addition, the chromoplast and chloroplast lycopene β-cyclases (CYCB, LCYb and LCYe) in OE fruits were upregulated compared with those in WT fruits (Figures 3D to 3F). 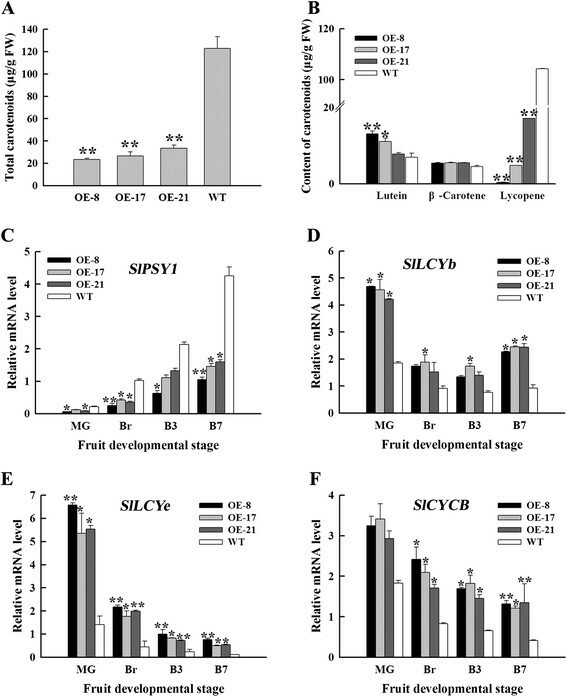 The upregulation of SlPSY1 and the downregulation of SlCYCB are at least partly dependent on ethylene; the relative ratio of lycopene to β-carotene in ripening tomato fruit is mediated by both of these processes ,,. These data suggested that SlNAC1 participated in tomato fruit pigmentation by regulating the carotenoid biosynthesis pathway in overexpression lines. On the basis of yeast one-hybrid experiment (Figure 5B), we can hypothesise that SlNAC1 may function in the regulation of the carotenoid pathway flux towards lutein and β-carotene and away from lycopene in SlNAC1 OE fruits. Tomato is physiologically classified as a climacteric fruit based on the dramatic induction of respiration and ethylene at the onset of ripening. Ethylene functions as a key regulatory hormone in fruit ripening . Ethylene emission of SlNAC1 overexpression lines was reduced (Figure 4A), suggesting that SlNAC1 is a negative regulator of ethylene biosynthesis in maturing OE fruit. Ethylene synthesis in ripening tomato fruit is regulated by ACS and ACO gene families . In tomato, the predominant ACS transcripts, namely, ACS1A, ACS2 and ACS4, accumulate in ripening fruits. Both ACS2 and ACS4 mediate the burst of autocatalytic ethylene synthesis, a process typically observed in climacteric ripening . Oeller et al. found that ACS2 is the predominant ACS mRNA in ripening fruits, and the repression of this gene blocks ripening. The upregulation of ACS2  and ACO1  resulted in ethylene and carotenoid accumulation. In agreement with the reduced ethylene production in the OE fruits, the transcript level of crucial genes involved in ethylene synthesis (SlACS2, SlACS4 and SlACO1) were suppressed to varying degrees (Figures 4B to 4D). Moreover, exogenous ethephon treatment partially recovered the phenotype of OE fruits (Figure 4E). These results suggested that SlNAC1 is implicated in OE fruit ripening probably by interacting with ethylene pathway. TAGL1 positively regulates ethylene synthesis; furthermore, reduced ethylene and a shift toward lutein and β-carotene accumulation occur in ripening fruit as a consequence of the repression of TAGL1 . The yeast one-hybrid assay results showed that SlNAC1 could bind to the regulatory regions of SlPSY1, SlACS2, and SlACO1 (Figure 5B). According to the previous report and the yeast one-hybrid results, we speculated that SlNAC1 negatively regulated ethylene synthesis in OE fruits. The tomato MADS box TF RIN, one of the earliest acting ripening regulators, is required for both ethylene-dependent and ethylene-independent ripening regulatory pathways. RIN participates in the regulation of lycopene accumulation and ethylene production by binding to their promoters, such as ACS2, ACS4, ACO1 and PSY1, which requires CNR ,,. The overexpression of SlNAC1 and the repression of RIN , CNR , HB-1 , TAGL1  or SlNAC4  all reduced lycopene accumulation and ethylene synthesis and resulted in similar non-ripening fruits. Furthermore, RIN, CNR, HB-1, TAGL1 and SlNAC4 were all reported to be the targets of RIN -,. Consequently, there might be some relationship between SlNAC1 and RIN in regulating tomato fruit ripening. However, it remains unclear now and will be further investigated. Softening is another important sign of fruit ripening and related to fruit quality and storage time. The softening of fleshy fruits is caused by changes in the structure and composition of their flesh cell wall. In climacteric fruits, the degradation of pectin and cellulose depends on ethylene during softening -. The results of fruit firmness analysis showed that the softening rate of OE fruits was inconsistent with ethylene production (Figures 4A and 6A), suggesting there may be an ethylene-independent softening pathway in tomato fruit. It has been reported that SlNCED1 suppression by RNA interference reduced ABA accumulation in the transgenic fruits, downregulated the genes encoding for major cell wall catabolic enzymes, and then increased the firmness of the transgenic fruits . The levels of ethylene, total carotenoids, lycopene and β-carotene, and the relative transcript levels of SlACS2, SlACS4, SlACO1 and SlPSY1 were enhanced in SlNCED1 suppression fruit . 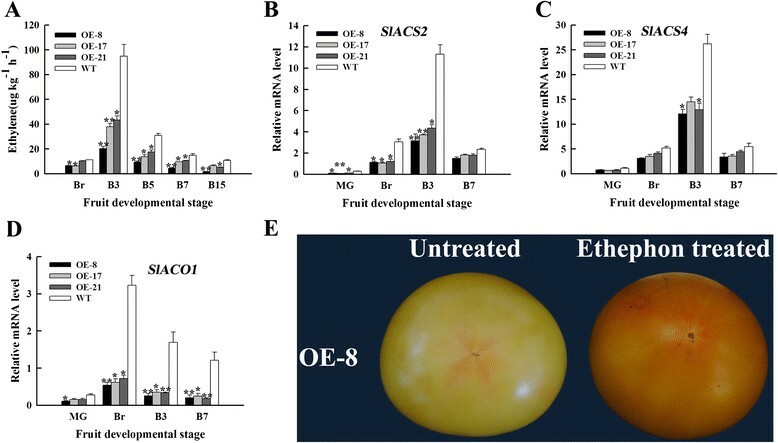 Overexpressing SlNAC1 increased the ABA content and expression levels of genes encoding for cell wall metabolism, leading to reduced fruit firmness (Figures 6A and 7). In addition, the levels of ethylene, total carotenoids, lycopene, and the relative transcript levels of SlACS2, SlACS4, SlACO1 and SlPSY1 were reduced in SlNAC1 overexpression fruit (Figures 3 and 4). These results were inconsist with the previous study. All these changes suggested that ABA negatively regulated fruit firmness. Nevertheless, the detailed mechanism that SlNAC1 regulates ABA synthesis is unclear now. Vrebalov et al. found that a decrease in the number of pericarp cell layers yield thinner pericarp tissues than normal characteristics. In our study, the pericarp thickness degree of the OE fruits was lower than that of the WT fruits (Figures 6B and 6C). This lower value indicated that the pericarp tissues of the OE fruits contained few cell layers; as such, a thinner pericarp was formed. Saladie´ et al. have demonstrated that fruit turgor is a major determinant of tomato fruit firmness, and as such, direct changes in pericarp thickness combined with resulting effects on water retention are likely to account for the increased softening of TAGL1 repressed fruit. Thus the reduced firmness or increased softening of SlNAC1 overexpression fruits might be caused by thinner pericarp. Overall, SlNAC1 functions in tomato fruit ripening via ethylene-dependent and ABA-dependent pathways in SlNAC1 overexpression lines. SlNAC1 transcripts accumulated in several tissues, including roots, stems, leaves, flowers, sepals, fruits and seeds, accumulated as fruit ripening occurred and reached the highest level at B7. SlNAC1 affected tomato fruit pigmentation by regulating the lycopene and ethylene biosynthesis. In addition, SlNAC1 regulated tomato fruit softening possibly by affecting ABA synthesis and changing the thickness of the pericarp. These data provided a new regulator functioning in fruit ripening and will probably contribute to further mapping of the regulatory network of tomato fruit ripening. The WT tomato cultivar (Solanum lycopersium cv. Zhongshu 6) and T2 generation OE lines collected in our greenhouse in May 2012 were grown in a climate-controlled greenhouse at 25°C/18°C at daytime/nighttime under natural light. Different tissues were harvested at designated time. Fruits were harvested in the following stages: immature green (IM); mature green (MG); breaker (Br); and 2, 3, 7 and 15 d after breaker (B2, B3, B7 and B15). Flowers were tagged at anthesis to measure ripening time. A pair of gene-specific primers (Table 1) was used to clone SlNAC1 for the construction of overexpressing vector. The fragments were inserted into the expression vector pBI121 at BamHI and SalI sites and then transformed into Agrobacterium tumefaciens strain LBA4404. Tomato WT cotyledon explants were transformed as previously described . The italic indicates restriction sites. GGATCC and CTCGAG represent Kpn I and Xho I, respectively. Tomato pigments were extracted from the pericarp tissues of fruits at B20 by using the modified protocols of Fraser et al. and Bino et al. . HPLC analysis was performed as described by Verbalov et al. . Frozen tomato powder (0.25 g) was extracted with 1.25 ml of methanol containing 0.1% butylated hydroxytoluene (BHT). The samples were shaken for 5 min, and 1.25 ml of Tris–HCl buffer mixture (pH 7.5, 50 mM) was then added (containing 1 M NaCl). The samples were shaken for 10 min; afterwards, 1 ml of cold chloroform containing 0.1% BHT was added to these samples and then shaken for another 10 min. The samples were subsequently centrifuged at 4°C for 15 min at 4500 rpm. The chloroform phase was collected; the aqueous phase of the samples was then re-extracted with 1 ml of cold chloroform mixture. The chloroform fractions were mixed and dried under N2 stream. The dry residue was re-suspended in 1 ml of methyl t-butyl ether (MTBE), vortexed, filtered using 0.45 μm and 4 mm polytetrafluoroethylene membrane filter and collected for analysis. All of the solvents used were of HPLC grade. The extracts were kept at 4°C and then shielded from strong light during the entire preparation. An Agilent1200 pump system (Agilent Technologies, USA) with an YMC-Pack reverse-phase C30 column (250 mm × 4.6 mm; 5 μm) was used in compound separation. The mobile phases consisted of acetonitrile:methanol (3:1, v/v) (A) and MTBE (B). Both A and B contained 0.05% triethylamine. The gradient elution process was summarised as follows: B ramped to 55% in 8 min and was maintained in 8 min to 35 min. The column was operated at 30°C with a flow rate of 1 ml min−1 and a sample injection volume of 20 μl. The UV spectra were monitored at 450 nm. The experiment was performed using three biological replicates (each with three technical replicates) and gained similar results. Five fruits harvested at different time periods were used as biological replicate. Fruits were harvested and exposed to air for 3 h to dissipate ethylene released by wounding associated with harvesting. The fruits were sealed in jars and then placed at room temperature for 2 h. An injector was used to mix headspace gas proportionately. Approximately 1 ml of fully mixed headspace gas was injected into a SHIMADZU GC-14C gas chromatograph equipped with a flame ionisation detector. The samples were then compared with a standard gas with known concentration. The measurement was performed by three biological replicates and each replicate contained 10 fruits at least. For ethephon treatment, fruits at the breaker stage were placed in ethephon solution of 3000 μl l−1 for 5 min and sealed in jars for another 7 d.
Total RNA was isolated from plant tissues by using an RNAprep plant kit (TIANGEN BIOTECH, http://www.tiangen.com) according to the manufacturer’s protocol. DNase I-treated RNA was reverse transcribed using the M-MLV reverse transcriptase kit (TIANGEN BIOTECH). Real-time PCR was performed using a Bio-Rad CFX96TM real-time PCR system and SYBR real-time Master Mix (TIANGEN). The samples (five fruits collected from different harvests) were represented by three biological replicates (each with three technical replicates); the standard curve method was applied. Template-free, negative and single primer controls were included for each gene analysis. EF-1α was used as an internal reference gene to calculate relative transcript levels. The relative gene expression levels were detected using the 2-ΔΔCT method . The primers used for quantitative RT-PCR are listed in Table 1. A Matchmaker Gold yeast one-hybrid library screening system (Clontech, CA, USA) was used to validate the interaction of SlNAC1 and promoters of SlPSY1, SlACS2 and SlACO1. The DNA binding domain of SlNAC1 (containing subdomains C and D) was cloned into the pGADT7 vector; the promoter regions (approximately 1000 bp to 1500 bp located upstream of the transcription starting site containing C/TACG sequences) of SlPSY1, SlACS2 and SlACO1 were cloned into the MCS of pAbAi vector. The transformation of yeast cells and confirmation of positive interactions were performed as described in the Matchmaker Gold Yeast one-hybrid system user manual. The primers used for this experiment are listed in Table 1. A firmness tester (GY-2) was used to determine fruit firmness as described by Wu and Abbott . A flat probe was placed on the equator of a fruit and used at a displacement rate of 1 mm s−1 to press an integrated tomato fruit at a total distance of 3 mm. The maximum force recorded at 3 mm of compression was used as estimated fruit firmness from the averaged value of at least 10 tested fruits and a minimum of three compressions per fruit. Samples of tomato fruit were harvested at the proper time and frozen at −80°C. The frozen samples were then ground to powder in liquid nitrogen. The ABA in tomato fruits was extracted and detected as described by Fu et al. . NDGA treatment was performed as described by Zhang et al. . Briefly, tomato fruits at breaker were harvested from the plants and then divided into two groups. 0.5 ml of 100 μM NDGA (group 1) and distilled water (group 2, control) per fruit was injected into the fruits from the pedicle with a medical syringe. Three replications were conducted for each treatment with 10 tomato fruits. The treated fruits were then stored at 20°C and 95% relative humidity (RH) for 3, 5, 7 and 15 d.
Data were presented as mean ± standard deviation. Significant difference between OE lines and WT was analysed using Student’s t-test (*P < 0.05, ** P < 0.01). Sequence data from this article can be found in the GenBank database (http://www.ncbi.nlm.nih.gov/Genbank) under the following accession numbers: SlNAC1 (AY498713); SlPSY1 (EF157835); SlLCYb (EF650013); SlLCYe (Y14387); SlCYCB (AF254793); SlACS2 (X59139); SlACS4 (M88487); SlACO1 (X58273); SlNCED1 (Z97215); SlNCED2 (EU912387); SlPG (X05656); SlExp1 (U82123); SlCel1 (U13054); SlWiv1 (AB004558) and EF-1α (X144491). In addition, the sequences of Solyc06g060230.2, Solyc07g063410.2, Solyc11g017470.1 and Solyc12g013620.1 can be found in PlantTF (http://planttfdb.cbi.pku.edu.cn/) or SGN (http://solgenomics.net/) database. We thank the expertise of Drs. Jinfang Chu, Xiaohong Sun, and Cunyu Yan (National Centre for Plant Gene Research (Beijing), Institute of Genetics and Developmental Biology, Chinese Academy of Sciences, Beijing, China) for determining the ABA contents of tomato fruits. This research was supported by the State Key Basic Research and Development Plan of China (2009CB118505) and the Natural Science Foundation of China (31071338, 31171474). NNM identified voucher specimen and carried out tomato transformation, majority of molecular genetic studies and data analysis. NNM also drafted the manuscript. HLF performed yeast-one hybrid experiment. XM and DL participated in phenotype analysis. DYY participated in vector construction and data analysis. CAW and QWM conceived the study, participated in the design and coordination of this study and drafted the manuscript. All of the authors read and approved the final manuscript.